One of our loyal visitors, Amy Baggetta submitted this cool picture from Salvador Dail. She said that “The unsuallailty of this pic allows the illusion to almost be unseen”. Can you find what’s the illusion in this picture? First thing you notice is couple of swans enjoying their swim. Look again! Can you spot some other animal present in the picture? Only one? Thanks Amy! 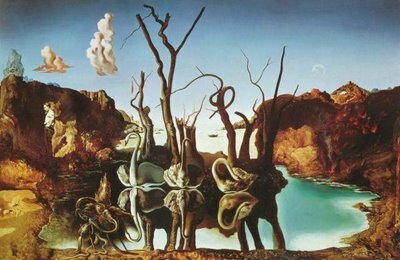 Others, be sure to check previous cool Salvador Dali illusion that can be found inside “Celebrities Category” as well in the “Multiple Meanings Category”. Next Mars Crater or Convex Mars “Island”? whoa that’s cool haha i like it. They are elephants in the reflection of the water! If you’re talking about the elephants in the reflection, that’s pretty cool. I can never tell what is an illusion in Dali artwork, there’s just so much always hidden in the art. The reflections of the swans look like elephants. I see three elephants. Are there any more?? once you see it, you can’t help but not see it…. still don’t see anything? check the water’s reflection. We see the shadows of swans as Elephants. Is that right? I see a man, by the rocks, next to the big white swan. Is that the other animal? I don’t know if my note got to you so I will try again. there must be more !! haha… the name of the painting is “swans reflecting elephants”…. Dalí was a truly genius!!!!!!!!!!!!!!! Lástima que no todos somos ni pensamos como lo hacía Salvador Dalí!!!!!!!!!! Salvador Dali, Geez… what a con artist. How did that guy ever make so much money? Amazing. Breathtaking even. This is a really nice one. theres a man standing on the left with a white shirt too!!! Woaaaah~ this is so cool….I noticed the elephants as soon as i saw the picture, but now when i look closely i notice much much more…. P.S. the tree behind one of the swans looks like a woman with her hand up…..
Those elephants are really cool!! a few more words: the swans, viewed from the right side, look like ovaries! Yes, there are three elephants. There is also a profile of a young girl to the far left–I’m surprised no one noticed or mentioned that. There’s elephants and a person hmmm…. i like human aspects in paintings. Is that a goat on the side of the picture?It’s head is white but the rest is abnornal and brownish. I am surprised that none of u have seen the bull! I have had this 20 foot poster on my wall for many years and I have found so much! If u want to see the bull then look on the right hand side at what looks like mountains. Once u sind the Eye u will see the bull! good luck! Has anyone noticaed that Salvador Dali himself is standing to the left of the pic, facing away from the swans? this is his anniversary paiting. He dedicated it to his wife. It’s called swans and elephants, because he thought that the most beutiful creaturs were swans, but the ugliest were elephants. If you look at the trees they spell out the word “love”. He also painted him self into the mountain on the left side. I see a man, a woman, and some elephants. Strangely, I see a form of a lady on one of the trees. Look closely. omg i didnt even notice the elephants! Hey, I saw this picture before. It was in my Aunt’s house! The person on the left someone said looked like a goat is tha painter himself turned backwords from the swans, Salvador Dali. I see something that looks somewhat like ‘Yoda’ from Star Wars, in the bottem, left corner.. Anyone else agree.. Or am I going nuts? I had to read the comments to figure it out so they were pretty good…. THANK you! Finally someone gets it! I see a triceratops on the right top … lava and city form his head … lava going down is one leg … tree is another one. tail is the coast in the background. but I might just be insane. See the painter himself on the right, his shadow projected on the yellow rock is in the shape of Gala, his wife looking like a gypsy girl (it makes out the head of the triceratops). Yes, the illusion is the 3 elephants formed by the reverted reflection in the water. – There’s another elephant to the right. – A mouse above the fourth elephant. – A woman in the tree above the first swan. You know this painting is called Swans Reflecting Elephants, right? Hardly an illusion. An unusuality is not a word.